Yesterday, Steve and I went to our first parenting class to really get this adoption process moving. I was excited all day, anticipating being with other people who had these common goals. It also meant spending some time with Steve to become better at a task we have been working on with our own two for seven years. But, the way the day started, I was wondering if I should rethink the whole "add another kid into this mix"...but that story is for another post that includes the joys(or trauma) of teaching phonics. A few deep breaths later and a prayer or two, we got the day back on track. The girls were so elated to be spending the evening with Kay-Kay aka Kelley, who is the best thing out there next to cherry coke or a shopping spree. But, who would have ever thought the day would end the way it did. I love Kay-Kay, BUT, the remnants of her night of babysitting are still lingering. She forgot to just push the popcorn button. "Oh, the smoke billowed," she giggled. I woke up at 3:00 a.m., because of the stink. Will the microwave survive? Who has tips on ways to remove the cooked on soot? Any helpful hints are appreciated. Have a wonderful day and pop a bag just for me. I can't think of a worse smell...well, maybe a few. LOL! You poor thing. I don't know...maybe putting a bowl of water and vinegar in there and boiling it, and then making a paste of water and baking soda to scrub it afterwards. 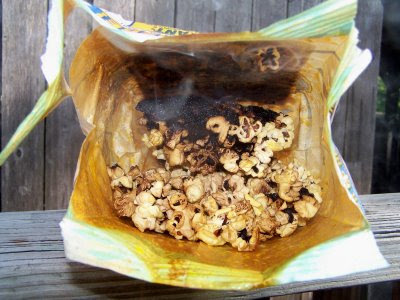 Man..I hate the burnt smell of popcorn! I hope you figure out how to get it out! Sorry no tips from me! Put it next to the curb on garbage day..should work. that will take a few days. That is a BAD smell. Your merman comment cracked me up. Thank you for praying for me. Please continue to pray.